DON'T GET FIT, GET FAT LIVE! 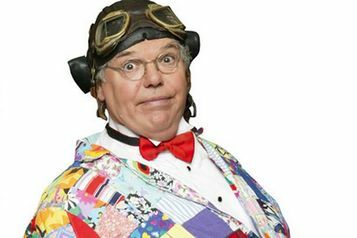 Most people who know of him will freely admit that Roy Chubby Brown’s name is one that is synonymous with rude, crude and extremely ‘not even near the knuckle but right bang on it’, blue adult humour. I’ll be the first to admit that when I knew I was going to be interviewing him, I thought to myself, “Do I really want to do this?” However, always one to rise to a challenge and, despite friends giving me that frowny, squinty eyed, sideways look, that says, “Oh my God, really?” followed by “Good luck with that one then!” I decide to go ahead a meet up with the man who’s act is reputedly filthier than a docker’s armpit at the end of a tough day. It seemed to me that if I was going to have the opportunity to talk to Roy Chubby Brown then I should really be prepared for any eventuality - his act is fully of smutty jokes and there’s absolutely no holds barred on the type of colourful language that streams out of this mouth. So, bracing myself, I took along a late Christmas gift for Roy as a way of hopefully buttering him up a bit and also giving him a chance to see that I'm a pretty open minded kind of gal (I have been known to say the odd naughty word on occasion) and possibly using it as a way of keeping the interview as clean as possible - I bought him a Swear Box. However, my initial fears were instantly allayed as Roy turned out to be one of the most charming men that I have had the pleasure to interview and within minutes I knew that we were going to get on like pigs in sh… - erm…I mean a house on fire. 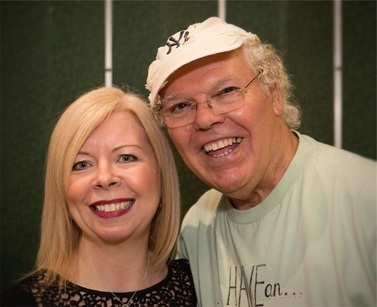 Watch the YouTube video of me chatting to Roy backstage at The Civic Centre in Grays on 7th January just before he went on stage to perform in his current show, Don’t Get Fit, Get Fat Live! which is coming to Southend’s Cliffs Pavilion on the 21st January. He tells me all about life with his wife, Helen and their young children, Reece and Amy and how he won’t have any swearing at home, how he deals with hecklers, how some people can’t seem to disassociate him from his stage persona and how reading a book by Bob Hope, whilst serving some time at Her Majesty's Service, inspired him to reach for his dream to become a comedian. Tickets for Chubby’s show are available from www.southendtheatres.org.uk or call the box office on 01702 351135.